1. Always keep a baby-towel around to wipe up incidents. ALWAYS! It is most inconvenient for me to need one, and then find out that Granddaddy does not have one handy. I was going to list some more things, but I have forgotten what they were. They will just have to wait until next time. Anyway, my Granddaddy and I had a fine time and we are looking forward to the next one. And I would write more, but 'scuse me now because it's time for my bottle. Posted in Camps and tagged Dalton, Learning By Ear, Murphy Method Banjo Camp on March 26, 2012 by Red Henry. This last weekend was the Murphy Method Banjo Camp, run and taught by Murphy and Casey. This particular camp was just for beginning players. The campers were all real good folks, and everybody had a fine time. And so, what did Red, the aged, tottering, grizzled patriarch of the family, do for the weekend? As previously noted, he took care of Casey's baby, namely Dalton Henry, who is two months old and mighty cute. 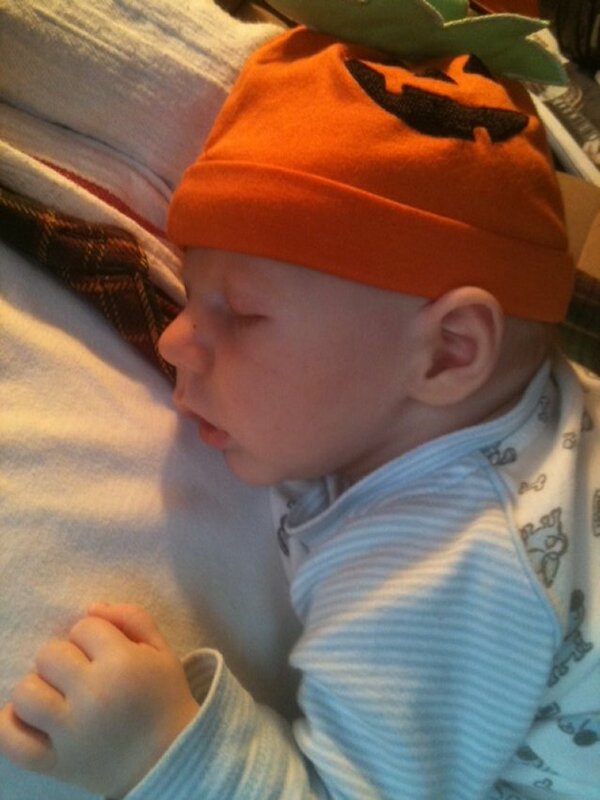 Even if he couldn't stay awake for Halloween. I mentioned before that Dalton is a beginning banjo player, because he can't help it. But there's more he can't help doing too, over the next few years, which includes learning to talk. And how children learn that is HIGHLY relevant to learning to play music. 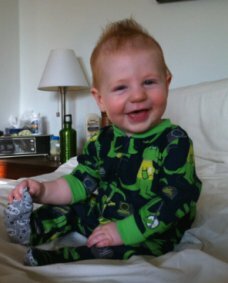 How does a child learn to talk? By listening and imitating people whom he hears. When you see the slogan "Talk to your baby!" it's important, because babies have to hear words before they can say them. A baby listens and listens before it learns to talk. And would anyone say that a baby should learn to READ before it starts to talk? Of course not. That'd be ridiculous. So what does this have to do with bluegrass? Only everything. If you're learning to make sounds (play music, that is), learn those sounds-- the notes-- BY EAR. Then practice. A lot. As Murphy says, "Listen, listen, listen, and play, play, play." Don't try to learn to play bluegrass music from a piece of paper. Do you want to know what the notes should sound like? Yes. Can paper show you that? No. Casey won't make little Dalton read before he can talk. That's not how people learn! Posted in By Red, Camps, General, Learning By Ear and tagged Dalton, Learning By Ear, murphy's misfits, red on November 2, 2011 by Red Henry. Since I pick with people when I get the chance, and I've also taught a good many music lessons in my life, I've developed an attitude about listening and learning. It's this: If you can't or don't listen, you can't play. At least, you can't play right. You have to know what a tune sounds like before you can play it. And tab won't show you what a tune sounds like-- you can only learn that from listening. Sound obvious? It's not obvious at all to a lot of folks. Murphy expresses this in a way when she says, "Listen, listen, listen, and play, play, play!" What does it mean? It means that you can't learn to play a tune right unless you've heard it, and preferably, heard it a lot. This is why tab won't help you to play a tune right, because tab can't show you what a tune actually sounds like. West-Coast banjo wizard Pat Cloud said in a recent Banjo Newsletter interview that he wishes his students would listen to a tune a hundred times before they looked at the tab. Well-known player Pete Wernick stated, also in BNL, that since students have to get away from tab eventually, it's better if they don't use it in the first place. What does this have to do with you, the Murphy Method student? Only that you need to listen. Listen to the music you want to learn. Listen to the music on CD over and over, whether it's on Earl's records, or Murphy's, or Casey's, or whoever else's recordings, but get that sound in your head before you expect to learn the tune! Once you know what the tune sounds like, you're ready to start playing it! And you'll learn a whole lot faster, too. Posted in banjo, By Red, jamming, Learning By Ear, Practice and tagged jamming, Learning By Ear, Practice, red on January 21, 2011 by Red Henry. Let's talk about playing music this time of year (and, as bluegrass aficionados may note, cop a title from the Stanley Brothers). Winter often seems to be a pretty dead time for performance opportunities and even jam sessions. Energy levels are low. In this part of the country, the weather may also prohibit travel to some events we'd like to attend. But it's important to Keep Picking, especially if you're learning to play. Even if you can't get out to play with other people (or if, as in some parts of the country, the nearest pickers are out of reach), you can play a little each day. You might be surprised at how soon you can get really rusty if you aren't playing-- sometimes, four or five days can set you 'way back. But even 15 or 20 minutes a day can keep your skills up to a tolerable level. That photo above was taken in 1971, when I was in the Air Force at Del Rio, Texas for a year. That whole year I never found anybody to pick with there, but I tried to play a little every day I could. And I not only held onto what I could play to begin with, but made some progress as well. Of course, it's always easier to practice if you have other people to play with. But if you don't, our Slow Jam and Picking Up the Pace DVDs are made just for you. You can also play along with Murphy at the end of nearly every lesson on our other DVDs. And I have heard of people even practicing with each other on the phone! However you do it, don't forget your Holiday Picking. Posted in By Red, jamming, Learning By Ear and tagged jamming, Learning By Ear, Practice, red on January 4, 2011 by Red Henry. Now, you may justifiably ask, what kind of title is that? Here at the Murphy Method we play bluegrass, don't we? 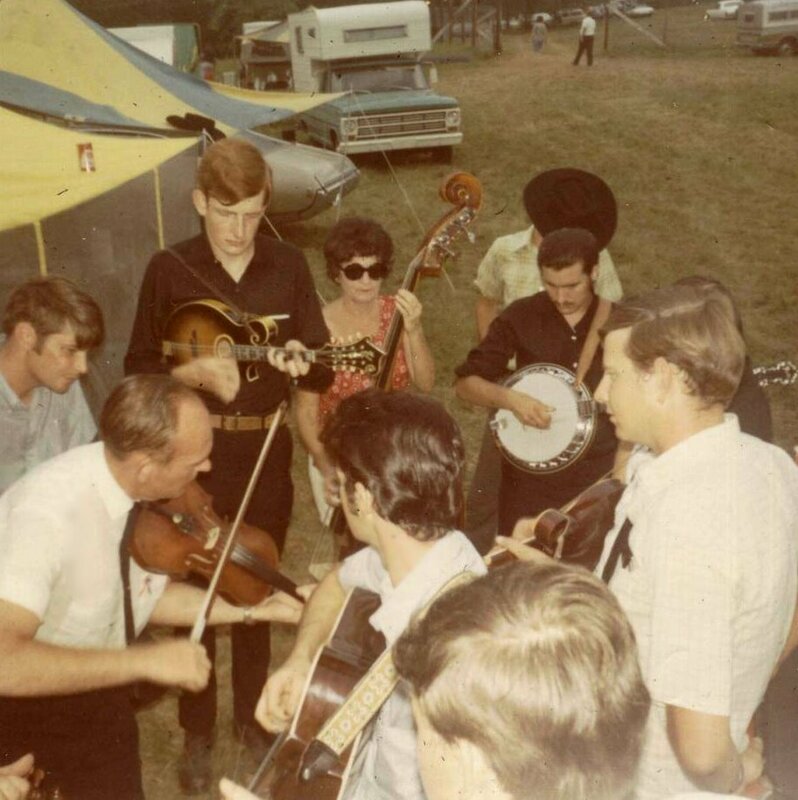 But I do get into old time picking sessions sometimes, and last Friday we had one at Cousin David's house. Now, this wasn't like the last session at Cousin David's. No, indeed. That time, we had 17 or 18 pickers in the Tater Hill Tavern. This time it was different. How many pickers were there? Three. Three musicians usually make a pretty thin jam session, but this time we had a good combination of people. Cousin David played the banjo, in his own unique old-time style. Our friend Jamie played fiddle at first, switching off later to banjo-ukulele (yes, such instruments are allowed in old-time music). I played mandolin mostly, but Cousin David had suggested that I bring my fiddle, and I picked that up for the last several numbers. And anchored by Cousin David's supernatural sense of rhythm, we played for a couple of hours and had a good time. We PAID ATTENTION and PLAYED TOGETHER. So what did we play? We played a few tunes that the bluegrass people know, such as Soldier's Joy and Red-Haired Boy. We played some old-timey classics like Cowboy's Dream and Old Mother Flanagan. And we also played some pretty obscure tunes, like Blake's March and The Squirrel Hunters. And why am I talking about all this? Because the basics of a good jam are the same in all kinds of music. You can have a good session with only two or three pickers, or with 20, as long as everybody PAYS ATTENTION and PLAYS TOGETHER. You might see people in jam sessions who aren't paying attention to anyone but themselves. These people sometimes play too softly to be heard, not because they're shy but because, I guess, they don't care about being heard (so why are they there? ), and others might be playing too loudly all the time. Either way, they're not LISTENING to everybody else and PLAYING TOGETHER. Or, you'll sometimes find people who try to crowd everybody else out of the center of the jam, or deliberately play so loud as to drown out other folks. What does that have to do with PLAYING TOGETHER? Nothing. Most of the people reading this blog know what to do in a jam session, partly because many of you have been in jams directed by Murphy or Casey. You can also practice listening and playing at the same time with our Murphy Method Slow Jam and Picking Up the Pace DVDs. But no matter where you are or whom you're picking with, always remember to LISTEN to the jam and PLAY TOGETHER! Posted in By Red, jamming, Learning By Ear and tagged david mclaughlin, jamming, Learning By Ear, red on December 15, 2010 by Red Henry. New tunes, okay. How about your old tunes? When you're learning to play, or even after you've been playing for a long time, there's a natural tendency to play your newest tunes. After all, they're new and much more exciting than your OLD ones. But you can get bored if you only play the tunes you learned most recently, and your musical skills can suffer. When you're practicing, or even when you're picking with other folks, remember to play your old tunes too. This does several good things. Among them: (1) You keep your fingers playing a wider variety of licks and melodies. (2) Your friends will enjoy the variety when you dig up a tune from the past. (3) You have the pleasure of re-discovering a great tune or song you'd almost forgotten. But one of the best things about picking your old tunes, is that it keeps your brain working. If you play just half a dozen or so songs all the time, it's easy to get into a musical rut and stay there for years. Instead, consciously go back and find tunes and songs you used to play. Keep learning new tunes too. Go through our Slow Jam DVDs and remember some songs you used to like. Your brain will like it, and your picking friends will thank you for it! Posted in By Red, General, jamming, Learning By Ear, Practice and tagged jamming, Learning By Ear, Practice, red on November 2, 2010 by Red Henry.